Can you imagine singing Pavarotti's "Nessun Dorma"
You will enjoy the experience - who knows you may even come back again! 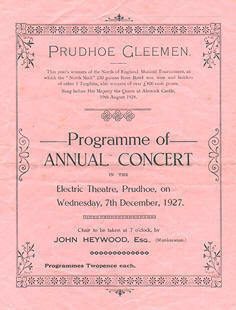 Our extensive archive does not record how many of these programmes were sold for the Annual Concert in 1927. They were priced at two (old) pence each so maybe you could have had all of them for about One Pound.